There’s no denying that watch collecting is expensive. However, there are ways to make it more affordable. Instead of buying a twenty to forty thousand dollar watch, you can buy a more affordable watch from an entry-level brand. Another option is to buy a pre-owned watch, and today we’re going to discuss the benefits of pre-owned watches. Nigut also recommends pre-owned watches because “it’s a great way to test new watches and get a feel for watches that you might not have been able to afford.” You aren’t bound to one watch for the rest of your life. You can test out a new watch to see if you like it and then trade it in after a few months or a few years. Plus, your style will change as you get older, so the watch you bought in your twenties may not be the watch you wear in your thirties. Or you may change jobs and need to retire your sports watch in favor of a dress watch. Instead of hiding the watch in a drawer, you can trade in your old watch and purchase a new or pre-owned watch. Pre-owned watches can be divided into two categories: recent models and vintage models. Buying vintage watches requires a bit more research and expertise. It’s more difficult to find a vintage watch, especially if you’re looking for a specific model. If you’re interested in buying a vintage watch, check out our 14 Tips for Buying Vintage Watches and How to Buy Vintage Watches on eBay. But today we’re focusing on recent models. As we’ve stated above, pre-owned watches are more affordable. The depreciation on a pre-owned watch ensures that you can buy a nearly new watch for a steal. Of course, some watches depreciate at a faster rate. For instance, a stainless steel Rolex Submariner will depreciate at a much slower rate than a Piaget ladies watch. For more information, check out our article on Which Luxury Brands Retain Their Value. Another reason to buy pre-owned is if your watch is out of production or simply not available anymore. Buying a pre-owned watch may be your only option if you’re not willing to compromise on the model. There are a few questions that you should ask before buying a pre-owned watch (especially if you haven’t seen the watch in-person). Ask for the service history. The watch’s service history will tell you if the watch has been maintained properly. If the watch is only a few years old, you may not receive much information. But it doesn’t hurt to ask! Ask if the seller has the original box and paperwork. This will help ensure the watch’s authenticity. Ask if the watch has any scratches or dents. Of course, you shouldn't expect a pre-owned watch to be in pristine condition. A few scratches can be expected, but you should know what you’re getting before buying the watch. If the watch has been dented, make sure that the movement is still functioning properly. If you drop a watch, it doesn’t just affect the watch case… the mechanical movement has also been jostled. Ask to thoroughly look at the watch and, if possible, the movement. If you’re purchasing the watch online, then ask for a variety of pictures. Look for any sign of rust, corrosion, or watch damage, and if found, avoid that watch. There are quite a few online markets for pre-owned watches, and the largest site to buy and sell pre-owned watches is Chrono24.com. Chrono24 offers a selection of over 150,000 pre-owned watches from both professional dealers and private sellers. A few other online options include: Crown & Caliber, World of Watches, Jomashop, Watch Shop, and Overstock. If you’d like to avoid arduous searching, you can always check out WatchRecon, which is a comprehensive search engine for pre-owned watches. If you’d prefer to see the watch in person before buying it (which is never a bad idea), we recommend visiting an authorized watch dealer that also carries a selection of pre-owned watches. These watches are typically from clients who traded in for a new watch. It may be more difficult to find a specific watch model; however, you’d be able to see the watch in person, try it on, and test it out. Josh Nigut and his team at Chicagoland’s Burdeen’s Jewelry have a huge certified pre-owned program. Finally, you may find your dream watch at an online or in-person auction. Of course, you’ll be bidding against other watch collectors, so make sure you do your research beforehand to avoid overpaying for a pre-owned watch. 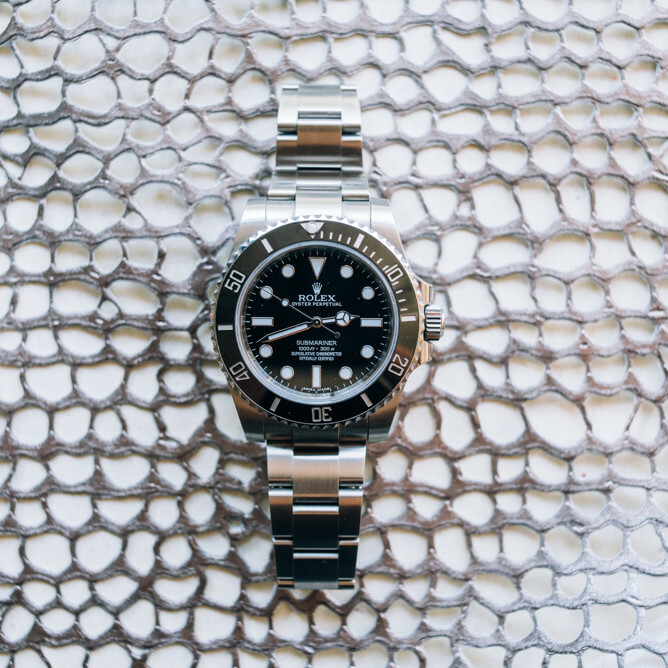 A benefit to buying a watch from a professional watch seller, instead of a private seller, is that the watch will most likely come with a 6- to 12-month warranty. If you do purchase a watch from a private seller, ask if the watch is still covered under a factory warranty.